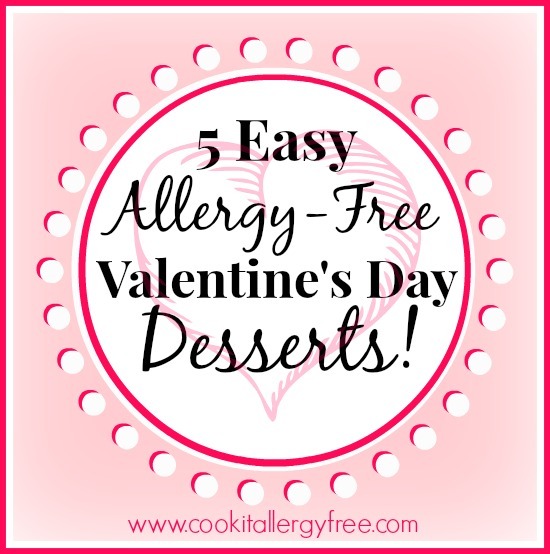 5 Allergy-Free Desserts for Valentine’s Day PLUS a Sweet Giveaway! My husband and I rarely go out on February 14th. Restaurants are usually overcrowded and overpriced that night. Plus, the kitchens are often busier than usual, so the food never seems to taste quite as good as if you were to visit the restaurants on a quieter night. Instead, we usually make a fun dinner at home with the kids and include some of our favorite treats. Their exact request this year: 1. Steamed Crab legs; 2. Daddy’s “Special Filet Mignon Steaks”; 3. “Something yummy” for dessert. 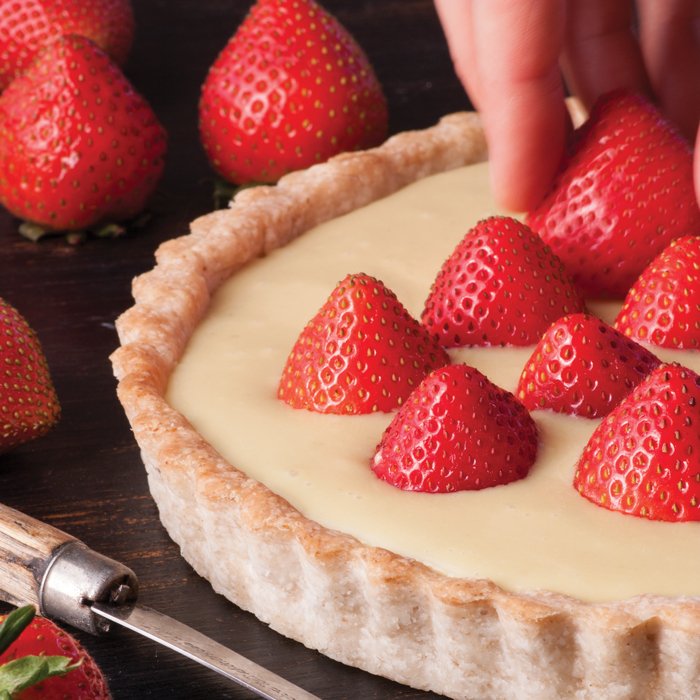 This time though, we are going to be making a Cream Pie! The Pie Crust will be coming from my absolute new favorite cookbook (which also happens to have a lot to do with my Sweet Giveaway). 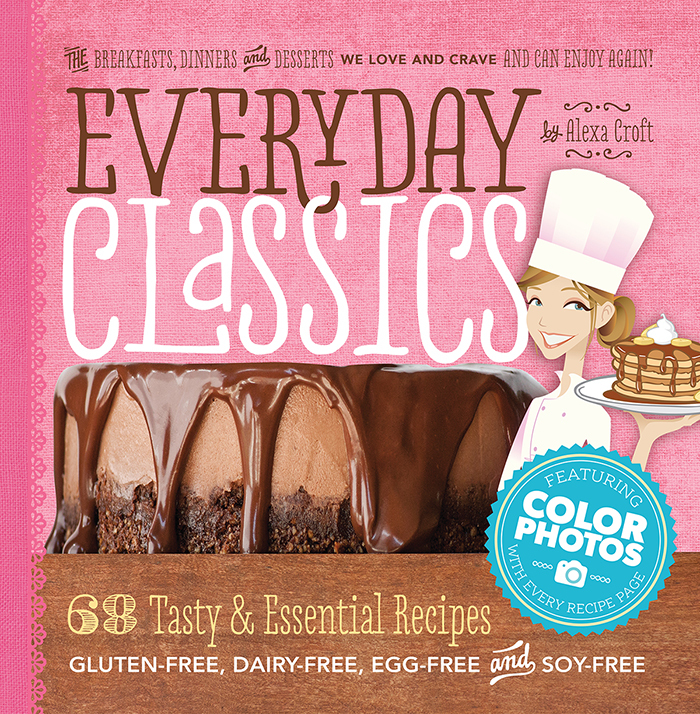 Everyday Classics: 68 Tasty & Essential Recipes – Gluten-Free, Dairy-Free, Egg-Free, and Soy-Free – by Alexa Croft, has become my new staple cookbook in the kitchen… and you are going to want it to become a staple in yours too! For you Allergy-Friendly cooks out there that miss all of the classics… THIS IS THE BOOK FOR YOU! The recipes are incredible. A lot of them remind me of my own childhood and the very recipes that my mom used to make. I have made a good portion of the recipes from the book so far and the biggest critics in the house (who, by size, ironically also happen to take up the least amount of space), have seriously fallen in love with all of them. living with food allergies, sensitivities and intolerances. Author Alexa Croft has put a healthier spin on our most beloved pantry staples, breakfasts, dinners and desserts, creating a new set of family favorites that are completely gluten-free, dairy-free, egg-free soy-free and 98% corn-free. AND…my favorite part….there are absolutely stunning photographs of every single recipe, taken by author, Alexa Croft, herself! You will love the simple recipes, the breakdown and guide of all of the recipes by food-allergen, and all of the Tips and Tricks that are included with each recipe. And because I will only share cookbooks and products here that I really believe will be perfect for my readers, I want to make sure that you know that this one tops my list! I love Everyday Classics so much that I am even personally giving away 3 copies of it to 3 of you loyal followers. To enter: just simply do One, Two, or all Three of the following for a chance to win one. Leave A SEPARATE COMMENT for each one that you do so that you can earn an extra entry for each. 2. Follow Cook It Allergy Free and/or Lexie’s Kitchen on Facebook, or tell me if you already do. The contest will end on Wednesday, February 19th at 9am PST. The winners will be announced then. You must be at least 18 years old to enter and live in the United States or Canada. What intrigues me is the ability to make recipes for my son that the rest of my family can enjoy as well. He has a severe peanut and tree nut allergy. Also, as of yesterday, we are eliminating dairy for a week or so to see if that helps with some other issues he’s having. Thank you. A pie crust that I can make for food allergy family!! This will be a good book to have handy. I have used some of Alexa’s recipes and always enjoyed the goodies. I follow both CookitAllergyfree and LexiesKitchen on FB. Thank you for the giveaway. Recently found eggs were not good for and I’ve always tried to avoid soy. I would love this cookbook!! I do follow CookItAlkergyFree and Lexie’s Kitchen. Love these blogs!! Thank you for all you give to the community! Just shared on Pinterest! Thanks for offering this giveaway – the cookbook looks amazing! I follow Lexie’s Kitchen on Facebook. I follow both Cook it allergy free and Lexie’s Kitchen on Facebook. Thanks for offering this giveaway. What intrigues me about this cookbook is just the fact that my son and I have gluten, dairy, soy and egg allergies so it would be great to have this cookbook as anothrr resource for great food we can eat! I will share link on facebook. Thank you for the chance to win! I have been gluten free for awhile and now that I have eliminated dairy also it would be really nice to more basic recipes the whole family could enjoy. I love, love love the pictures, that makes a cookbook great! We now need to be corn free as well. I would love help to do this! I am now following the blogs! I am excited about egg free!! I also follow both on fb! I am always looking for healthy, delicious new recipes and these look wonderful! Thanks for the giveaway! I love this cookbook because I am an advid baker. Baking is difficult now that I have to be gluten and dairy free for my baby. This cookbook would bring the baking back into my house! Already following on facebook! I love that this cookbook puts a healthier spin on favorite classic recipes and still keeps them gluten free. Thanks for the giveaway. Absolutely can’t have enough inspiration – especially for recipes for all the above – quite often have to try substitutes in other recipes – because often others only deal with one aspect. I have recently discovered that soy is another item that bothers me – so this cookbook would be great to have ready to use recipes! Everything intrigues me about this cookbook…gluten-free, vegan recipes, even coconut free recipes! I follow both blogs and am a fan on facebook! This looks like an invaluable resource. I appreciate that she has created so many easily adaptable recipes to help those with multiple sensitivities. I am a follower of both you and Lexie’s kitchen on Facebook. I am still muddling my through cooking with allergies. The few cookbooks that I have are great, but I feel like I need more recipes to have enough variety. I am a new follower on Facebook also. I am so intrigued by this book! My daughter has an egg, dairy and wheat allergy as do I!i love any recipes that are allergy free and easy and tasty! Excited to see this book! I am follower and I shared on Facebook! I have only been on the GF/DF road for about 2 years, so I am always looking for new ideas and recipes!! I just started following both sites on FB. I shared this post on FB. That pie crust looks amazing, and I am intrigued! Loving chocolate recipes and owning a gluten free book. Thanks for a wonderful giveaway! I also followed both of you on face book and pinned on Pinterest about the giveaway! I’m intrigued about this cook book because I’m new to allergy free eating and am still discovering what and how to eat. I was recently diagnosed with IBS and my diet is very bland right now so I would LOVE to win this book! Thanks for writing it! I followed on facebook as well. Having recipes that are gluten and allergen free that are based on everyday classics and taste great will make it easier to get my family on board with my eating habits and allow me to cook one meal for everyone rather than and for me and one for them! What intrigues me is that the book is classics and not odd un appetizing foods. Love love this type of cookbook as my family deals with multiple allergies and sensitivities. i have this book in my favorites for some day…now i have found i can not eat dairy or eggs or gluten and scrambling for foods to prepare. thanks for writing this book! I adore both sites and follow both. We have so many food allergies in our family that Lexie’s book would be a dream to have. Thanks very much for the opportunity to win one. I am new to the dairy free, soy free, and gluten free lifestyle. So I am at a loss as to what to make for our family of 5. I would love to have some recipes. The internet can be difficult to navigate when you’re trying to incorporate so many “no’s” into a “YES!” recipe. I have a long list of food restrictions, and this cook book looks like it would be just what I need. I made your 90 second chocolate cake last night. I cheated and made it according to your directions. Now I will try it with coconut oil and coconut milk, as dairy is one of the foods I am not supposed to eat. I will not be one of your followers on Facebook! Thank-you for sharing your work with us! I just shared it on Pinterest! Liked on Facebook and signed up for your emails! What drew me to this cookbook is the fact that it is not only gluten free recipes, but egg free as well. Not always easy to find! Hope I win!!!!! I followed and shared on facebook. I would love this book! I eat gluten free. Would love to win this cookbook to give to my son who follows a GFCF diet but gets tempted to have “normal” food sometimes–with these recipes he can have both! My 8 yr old son was recently allergy tested & his worst allergies are all the things he loves…Egg, Milk, Cheese & Wheat! So, needless to say, it has been a HUGE transition for him & our family of 4. I am constantly researching online to find replacements for recipes he loves or how to even omit an ingredient & substitute with another!! Thankfully, he is not a fussy eater but he does miss sinfully sweet desserts & his eggs in the morning. This cookbook would be incredibly helpful for me to cook fun & new recipes for him! I would only have to open up the cookbook in my very own kitchen to find a new recipe, instead of having to sit at my computer, racking my brain of what to cook for him next?! This cookbook would be a LIFESAVER & make my son incredibly HAPPY!! I have LIKED Lexie’s Kitchen on Facebook!! I have Shared this on Pintrest!! Hope I win!! Love to see some gluten free vegan pie crusts! Looks like an amazing book!